Scientists a functioning their way during a block of mudstone when they found a skull that seemed a bit different. The researcher’s attention they were looking at fossils of a Coelophysis--a small carnivore. Senior curator Robert Sullivan and fossil preparer Kevin Dermody rapidly realized this was a dissimilar dinosaur. "The head is different, because it's shorter," he described. "The teeth are procumbent in that they join out towards the front of the skull. The teeth look as if to be longer. 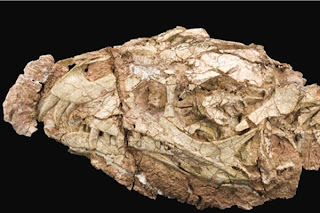 And there is several other subtlety of the skull that differentiates it from Coelophysis. Sullivan alerted paleontologist at the Carnegie Museum, which owns the mudstone chunk. 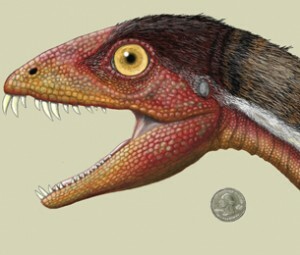 Researchers present and at the Smithsonian exhausted years investigating the skull, and have now decided it is, in detail, a new dinosaur called Daemonosaurus. Their conclusion was available last month in the scientific magazine Proceedings of the Royal Society B. How does it feel to assist determine a dinosaur? "I do get new dinosaurs on time," said Sullivan, pleased. "This is strange in that we did not expect to find it in the block. And this just goes to show that we don't know everything there is to recognize about the prehistoric life 220 million year before," he said. "Nobody has found anything fairly like this on one of those additional blocks. So it's clearly a typical find, and, of course, it is the initial and only one of its type," Sullivan constant. "So from that point of view, we were fairly timely to play a slight role in its discovery." The early find was made in the museum's Dino Lab, an interactive exhibit showing visitors how skeletons are organized after detection in the field. Here's how the museum's website explains the demonstrate: "Later than fossils (including dinosaur skeletons) are establish in the field, several steps, not usually seen by the public, are taken to arrange the fossils for demonstration. Visitors can observer this procedure of recognition the fossilized bones from the rock that surrounds them."